Most people prefer metal braces because they are easy to maintain and to remove. Moreover, the installation process is easy, and any qualified orthodontist can be able to provide a patient with these particular braces. The installation process involves the use of brackets and glue. The glue is used to attach the brackets to each tooth. Read on for more information about Metal Braces. These particular braces do not attract much attention when you smile such as the metal braces. That is because metal braces are much visible than ceramic braces. Moreover, they have a great look even when they are installed. However, you also need to understand that ceramic braces are quite expensive and fragile compared to metal braces. Get more information on Ceramic Braces. Unlike ceramic braces and metal braces that are attached to the front of the teeth, these particular braces are attached behind. That makes them invisible to people eyes, and you can smile without the fear of them being seen. The price of having lingual braces attached is higher than that of traditional metal braces, but they are convenient. Acquire more information on Lingual Braces. Invisalign braces are not attached to your teeth permanently, and they can be removed when necessary to floss or brush. Moreover, the alignment trays are derived from molds, which make them not only virtually invisible but very expensive. Find out more on Invisalign braces.o. Self-ligating braces are considered to be the modern type of braces. They are designed to produce quick results within a short period. Furthermore, another great benefit of having these particular braces is that you do not have to book an appointment with your orthodontist every time. Find out more on Self-ligating braces. These advanced braces are not only designed to give you a perfect smile, but they are also designed in a way that they provide information and measurements, which are used to determine how long a patient should have the braces on. Find out more on Smart Bracket Braces. Clear braces blend well with the natural color of your teeth. This makes then transparent and difficult to identify. Learn more about Clear Braces. 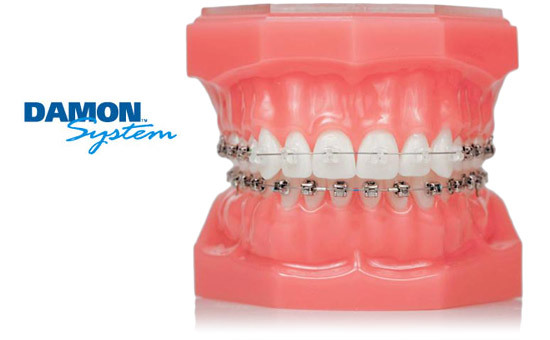 Damon braces are best for those who want their teeth to be straight. However, these particular braces are easy to maintain even though they are not easy to attach. Find out more about Damon Braces.